The Agbaja Project is located on the Agbaja Plateau in Kogi State, Nigeria, approximately 200 kilometres from the capital city, Abuja. The Plateau hosts an extensive, shallow, flat-lying channel iron deposit (CID) and Kogi Iron has determined a Probable Ore Reserve of 205 million tonnes at a grade of 45.7% iron (Fe), estimated in accordance with the JORC (2012) code. Mineral Resources on the plateau are 586 million tonnes with an in-situ grade of 41.3% and comprise an Indicated Mineral Resource of 466 million tonnes at 41.4% Fe and an Inferred Mineral Resource of 120 million tonnes at 41.1% Fe, all estimated in accordance with the JORC (2012) code. 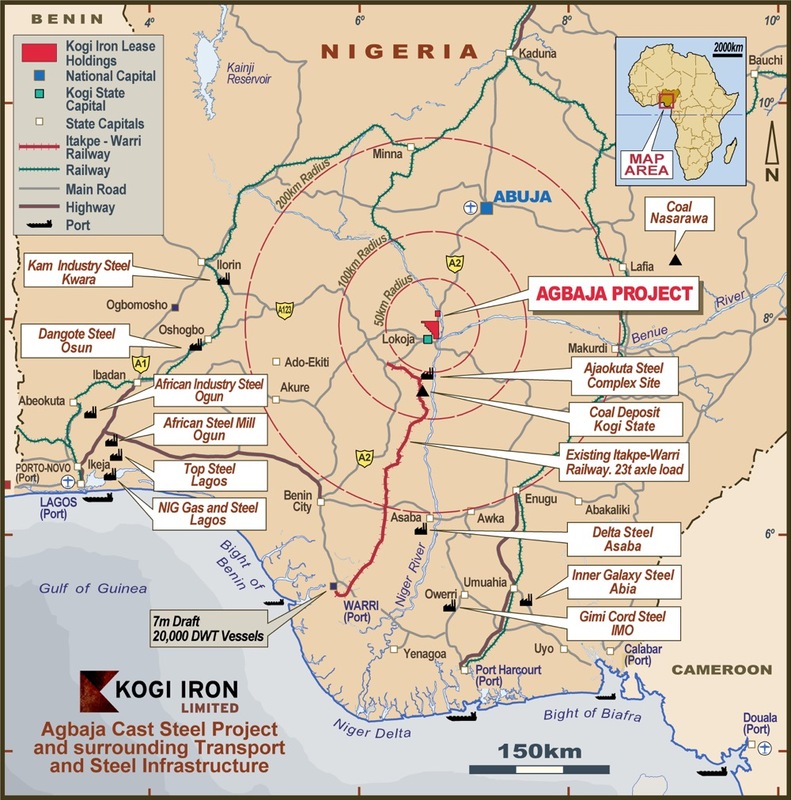 The Agbaja Project is uniquely positioned proximal to existing, under-utilised infrastructure including road, river and power suitable to facilitate a major cast steel project. Since 2016, the Company has advanced its intention to develop an integrated steel plant utilising the company leased iron ore deposit and nearby coal and limestone sources. The results of a laboratory scale test on the iron ore demonstrated that it could be converted to a steel feedstock suitable for electric arc furnaces. In November 2017, the Company commenced a Pilot Plant Test Program on a large bulk sample to demonstrate the process in a continuous batch mode. SD Capital and GKB Ventures Ltd were jointly engaged in October 2017 to secure debt funding for the Project as well as equity finance to complete the DFS and Project financing. The majority of the debt funding is expected to come from Export Credit Agency funds and a detailed program is underway to ensure agencies are well aware of the Project. Dr Burston has more than 30 years of top level experience in Western Australian and international iron ore mining and export sales. He has held executive management and Board positions with some of WA’s largest and most successful mining operations. Dr Burston previously served on the board of African Iron Limited as Chairman and on the board of Fortescue Metals Group Limited. He was also involved in a number of mining services companies as Non-Executive Chairman of NRW Holdings and as a board member of Mincor Resources NL. During his career, he has developed several multi-million tonnes per year exporting operations with outstanding track records in maximising production, transport efficiencies and project development. Dr Burston has also held major roles in industry associations and local government. He was awarded Citizen of the Year (Industry and Commerce) 1992, Member of the Order of Australia (General Division) 1993, and Honorary Doctor of Science (Curtin) 1995. He is a Fellow of the Institute of Engineers of Australia, the Institute of Mining and Metallurgy and the Institute of Company Directors. Martin started his career at NM Rothschild, Standard Bank and Benfield, working in the resource finance and advisory departments and being responsible for over $2Bn worth of transactions at these institutions. In 2003 he rowed the Atlantic solo and, on his return, established Vicarage Capital Limited, a UK based brokerage specialising in O&G, precious & base metal focused exploration, development and production stage companies, with assets located across the globe. Mr Carroll is a former executive with BHP Billiton with over 30 years of experience in the mining industry, principally overseas in Asia, the United States and West Africa. During this time he was responsible for the early development of the Kalimantan coal projects, the marketing of minerals in Asia, including China, and was the President for BHP Billiton in Japan and India. He was also the CEO for the Guinea Alumina project in West Africa. He holds a Bachelor degree in Mining Engineering from Sydney University, is a member of the Australian Institute of Mining and Metallurgy and the Institute of Company Directors. Michael is the Chairman and a founding director of Terrain Capital. He has worked in the accounting and finance industries for more than 45 years and has a broad range of senior advisory and project management experience in all facets of corporate finance. His primary responsibility is the strategic leadership of Terrain Capital’s business. Michael is currently Chairman of Dacland Pty Ltd. He was formerly a director of Elysium Resources Limited, Vision Super Pty Ltd, Industry Fund Management Pty Ltd Investor Advisory, Yarra Valley Water Ltd and South Australian Tourism Commission, Oliver Hume Corporation Ltd and Free Eyre Ltd.